To enroll your child in the Park East Early Childhood Summer Program, please click here. 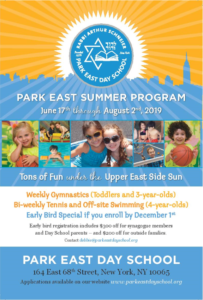 To enroll your child in the Park East Taste of Summer Program, please click here. We are happy to announce the Rabbi Arthur Schneier Park East Early Childhood Summer Program available to children who are 2, 3, and 4 years old. The program runs from Monday, June 17th, through Friday, August 2nd, 2019. Parents may choose 2 week through 7 week options. The weeks need not be consecutive. The program starts every morning at 9:00 am. Dismissal varies depending on your child’s age. The incoming two year olds and transitional threes dismiss at 12:00. The incoming three year olds (current toddlers) dismiss at 2:00 and the incoming four year olds (current three year olds) dismiss at 3:00. Snacks will be provided for all age groups and hot lunch will be served for children who stay until 2:00 and 3:00. 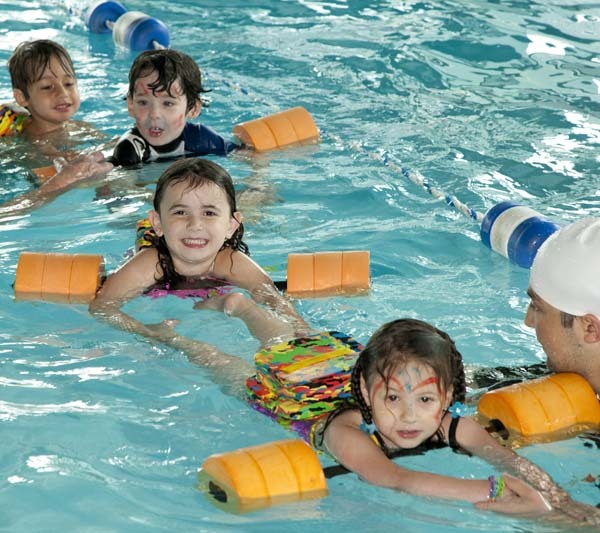 Every group is led by a nurturing, licensed teacher along with an experienced assistant. The days are filled with fun summer activities including outdoor swim in wading pools, sprinklers and playground activities. Our 4 year olds go off site 2 times a week for instructional swim with Take Me to the Water and receive tennis lessons from trained professionals. In addition to fabulous craft projects, your children can look forward to games, science, music, and water play. 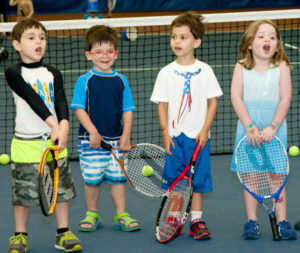 The children will also attend Specialties such as movement, art, cooking, sports instruction and Oneg Shabbat every Friday. We are also planning several special events – petting zoo, carnival, etc. Your Preschoolers will be challenged socially, emotionally and physically in our child-based program that is both fun-filled and educational. They will be encouraged to practice teamwork, develop self esteem and build confidence. We look forward to having you join us for a fun filled summer! For any questions contact Debbie Rochlin at 212-737-7330 ext. 1409 or email Debbie@parkeastdayschool.org.